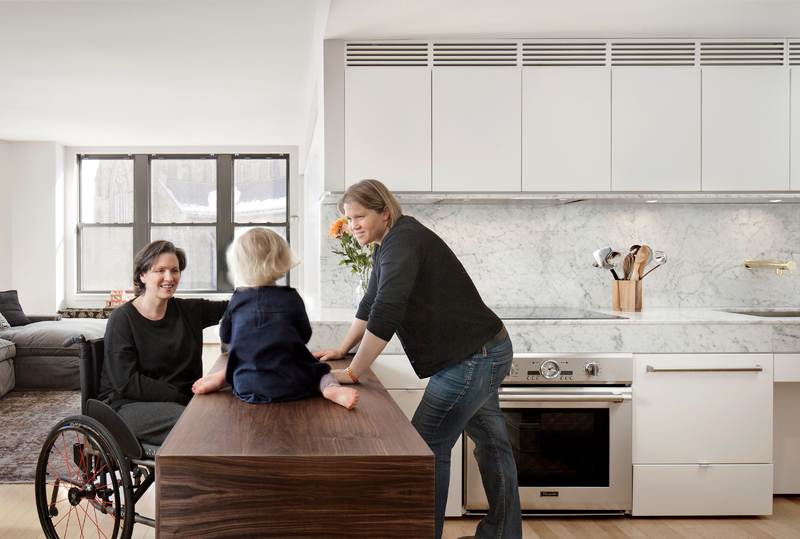 In renovating the 90-square-foot kitchen of a Boston apartment, architect Chris Greenawalt drew upon both spatial and material solutions to create a pleasing and wheelchair-accessible space to accommodate all three of its tenants. After an accident severely limited his mobility, filmmaker Murray Siple modified his Vancouver home to be wheelchair accessible. In the kitchen, all the cabinets are easy to open, there’s space under the cooktop for his wheelchair, and a faucet over the range removes the need to haul pots to the sink for filling. Brod Hart’s home in London—which had past lives as stables and a piano factory—is now filled with DIY hacks that make it more accessible. The most remarkable is the elevator he designed himself. A simple counterbalance operates the lift, allowing him to get up and down the stairs even faster that guests who take the adjacent industrial stairs. In New York's Chelsea neighborhood, David Carmel's home proves that even apartments can be made more accessible. David’s desk, like the other furniture in the apartment, was chosen for both style and wheelchair accessibility. Wood floors provide a smooth surface for his wheelchair. In Seattle, architect Carol Sundstrom retrofitted this 1954 modern home to be more accessible. The shower can accommodate two, and has Hansgrohe heads of differing heights with separate controls from Cifial.